Program notes for the St. Louis Symphony Orchestra, December 8–10, 2017. © Benjamin Pesetsky 2017. Not to be reprinted without permission. Vivaldi wrote the four violin concertos now known as The Four Seasons sometime before 1725, when they were published in Amsterdam as part of a larger set of 12 concertos called Il cimento dell’armonia e dell’inventione (The Contest Between Harmony and Invention). Amsterdam was known for its high-quality and well-connected publishers, and Vivaldi had released music there since L’estro armonico, Op. 3, in 1711. His publishing firm, run by Estienne Roger and family, advertised in newspapers and offered a mail-order service, making Vivaldi’s music widely available across Europe. 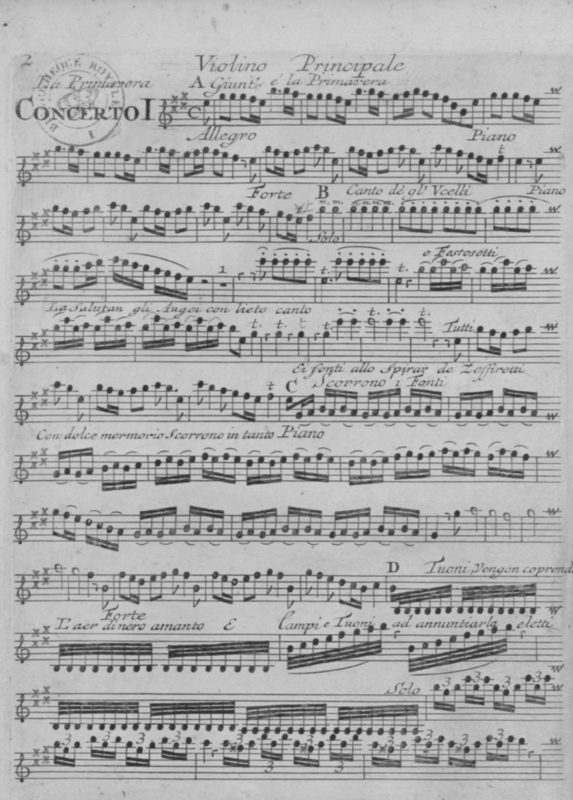 The concertos were first presented in manuscript to Vivaldi’s Bohemian patron, Count Wenzel von Morzin, whom he served from afar as maestro di musica in Italia. Vivaldi, who was a virtuosic violinist, likely performed them in Italy before they were published. Then to create an appropriately embellished print edition, he added descriptive sonnets, which he probably wrote himself. They appear both as a preface to the solo violin part and in excerpts scattered throughout the orchestral parts, showing the exact correspondence between the scenario and the music. The concertos were at the cutting edge of early 18th-century music, both because the solo concerto was a recent development, and because the use of an underlying story, or program, was a relatively novel concept in instrumental music. Even in their renewed 20th- and 21st-century popularity, these pieces sound sharp: their slippery harmonies and bracing dissonances appeal to modern ears, while their earthy, elemental subject-matter makes them both literally and figuratively perennial. First page of La Primavera (Spring) from the 1725 Amsterdam edition. Lines of poetry are included between the musical staves.